Today I look at Superhero RPG games released in 2014. That was a good year for supers in general, though perhaps not in comics. There we saw experiments and counter-experiments burning bridges. But on TV we got The Flash, Agent Carter, Gotham and Constantine. Those join ongoing series Agents of SHIELD and Arrow. It’s worth noting how many of those are only tangentially supers. In the theaters we got a new TMNT, the franchise-killing Amazing Spider-Man 2, an underrated Big Hero 6, the overrated X-Men: Days of Future Past, a happiness-inducing Guardians of the Galaxy, and finally one of the best superhero films ever, Captain America: The Winter Soldier. The year’s a little thinner for RPGs. 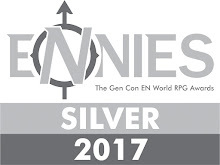 I don’t mean that as a slight against the tremendous products released (AMP: Year One, Cold Steel Wardens, Worlds in Peril). I mean it seems like the market slices out thinner and thinner. While 2013 has a massive influx of new games, the number drops in 2014. But we’re still seeing many more new systems, rather than the expansion and support of existing ones. We have a lot of superhero games out there: many of them just engines and others tied to a setting. It seems like gamers’ dissatisfaction with existing mechanics pushes them to build new ones. I don’t know if that fragmentation happens more with supers or if it just feels that way. That’s probably a question for someone who knows data and can figure out how to model that. In any case, a solid year for Superhero gamers with a host of new options. HEY! I have a Patreon for these lists. If you like them, consider contributing orresharing to spread the word. 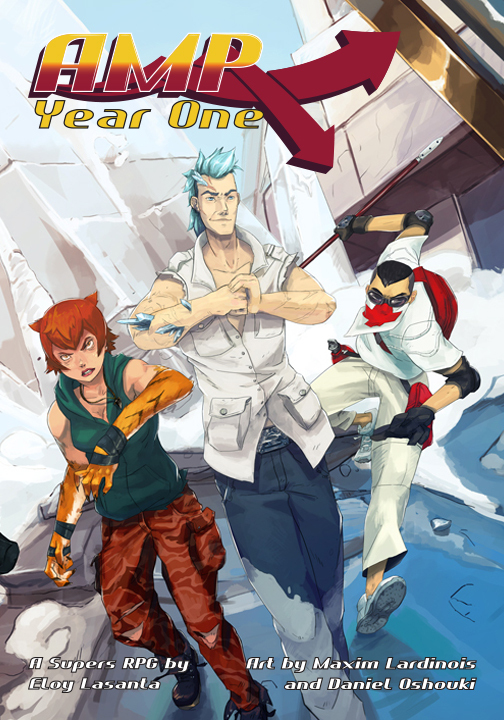 AMP: Year One falls into the category of Setting-Immersed RPGs. Some Supers games only offer a system, while frost it with a thin layer of background. But a few build their games and mechanics in tandem with the setting. Aberrant and Rotted Capes come to mind. AMP takes that further. In the setting events lead to the sudden explosive appearance of many people with "Accelerated Mutant Potential." The book offers some explanations for the rise, but the full tale's part of the metastory. AMP: Year One covers the first year of supers. That's a smart focus- and parallels the development of the Marvel Cinematic Universe recently. Eloy Lesanta (Wu Xing, Infestation) offers a lot of background and history in AMP: Year One. He clearly presents the rich world. While the character sheet looks fairly complicated, the system's actually simple. Powers group into Strains, with distinct elements associated with them. They're nicely organized and reinforce the flavor of the setting. The book’s solid and worth reading, especially for GMs interested in new approaches. This year Lesanta released the second volume, AMP: Year Two. That moves the timeline forward and offers new advances for the PCs. For a long time everyone in our gaming circles wanted to play street-level superheroes. That started in the late 1980s, an effect of Watchmen, The Question, and Miller's work on Batman and Daredevil. Eventually Dark Champions (First Edition) would cater to this kind of low-powered game a few years later. By that time a different kind of street-level supers comics would be in vogue. It felt more brutal, more visceral. It wasn't necessarily low-powered, but it definitely had superheroes doing whatever they wanted to bring justice. That would eventually be known as the Iron Age. I skipped reading comics for most of the '90's so I missed that transition, except for the occasional single issue of something like WildCATS I borrowed. It all seemed grim, strange, and covered with pouches to me. Until now the most significant attempts to gamify that era have been Champions: New Millennium and Iron Age for M&M. Cold Steel Wardens does a takes on the most interesting new themes from the 1980's. It references the social turmoil and changes of the period. While it focuses on the Iron Age, it leans towards the earlier part of it. It has a great hook, and unlike many superhero games it puts that front and center. CSW has its own system: point-buy and relatively light. The mechanics take up the bulk of the volume. Usually I'd point that out as a potential problem. But instead of just being a new game system with a thin wrapper of setting, Cold Steel Wardens supports the genre. Characters take Strain, both physical and mental. Those aren't just Hit Points or Body. Taking that damage incurs checks which can lead to collapse and breakdown. Mental deterioration can lead to psychoses. Motivations and stances for characters also affect play. Everything feels tuned to serve the genre. The powers list feels strong, but not exhaustive. General types are presented (Blast, Adhesion, Immunity). Each has options for additional effects and drawbacks. It looks quite easy to build a character. CSW also includes a solid GMing section, covering how to present the genre. There's a setting, New Corinth, detailed in 60 pages (if you include NPCs). That's useful and could easily be adapted to other campaigns. Overall if you like new superhero rpgs and have a fondness for this era in comics consider checking it out. Cold Steel Wardens manages to treat an often parodied era with some seriousness. But it doesn't revel in grimdark. Instead it strikes a smart balance. Not to be confused with the recently Kickstarted Masks. This Masks is another retroclone from Gratis Games, creator of Codename: Spandex and Dark Dungeons. But this isn't a straight translation. Instead it mashes together Fudge and FASERIP (aka Marvel Superhero RP). That's a neat take, especially since we've already seen a handful of direct FASERIP rewrites. 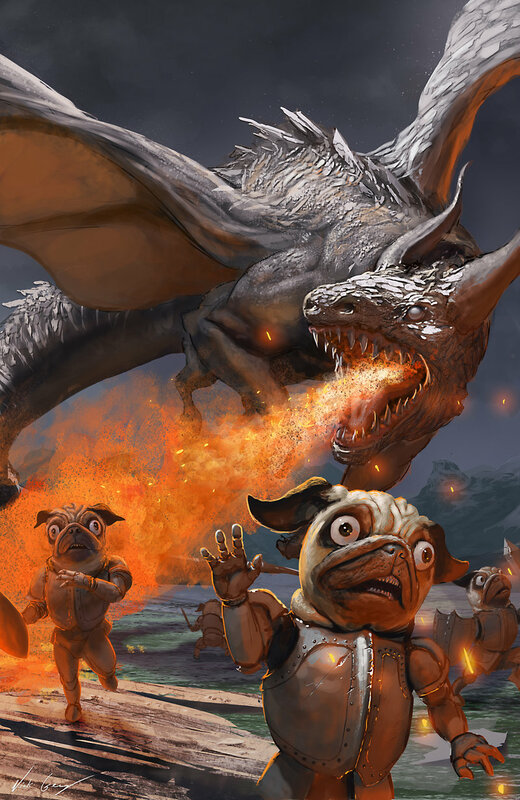 Masks has a ton of interesting material, presented well (with a plethora of Storn stock art). Masks includes no setting info, but instead offers a solid and quick superhero system with a comprehensive power set. It focuses on more classic super-tussle gameplay over anything more narrative. And for a product you can download for free, it amazingly has a decent index. Green Ronin dialed back their support of Mutants and Masterminds. Their Gadget Guides assembles the previously published guides for gadgets and items. I like that approach of putting out electronic supplements and then bundling them. Beyond that the company released the Atlas of Earth-Prime series. That expands the world used for the house setting which includes Freedom City and Emerald City. Hopefully we'll see a bundled version of that in the future. A small game by Sage LaTorra (co-designer Dungeon World, Saga of the Icelanders). Powers for Good has a sharp focus. The rules are fairly abstract and narrative driven. Players create descriptive tags for powers and associate dice for actions. It reminds me a little of Marvel Heroic. There's also a strong AW vibe, especially in the GM section. The quick mechanics take up most of the 37 page book, with the last four pages given over to a quick scenario "Dr. Fission vs. The World." It has some decent art, usually full page. While the cover looks like a Pulp Action game, the material's much more aimed at four color. It cites All-Star Superman and Astonishing X-Men as inspiration. The designer intended this as the first of a series of games. However Powers for Good doesn't seem to have had any follow up. It is currently available PWYW on RPGNow. Project H.O.P.E. is an Italian Supers RPG I missed on my earlier lists. It first launched in 2008. The system has gone through a couple of editions so far and (I believe) has several supplements. In 2012 they tried to raise money for an English translation via Kickstarter, but were unsuccessful. It has a WW2 setting, combined with Dieselpunk elements. The Silver Age supplement seems to expand the rules and add more setting material, but it may be beyond my Google-fu. Anyone have more info on this game? An Italian supers rpg self-published in hardcover. 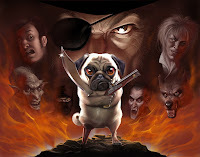 This game Kickstarted in early 2014, with both an Italian and English language edition. The former released in'14, while the latter is supposed to land this year. That's an exciting development in gaming IMHO: games released in multiple languages and/or quickly translated. The designers recently ran online events for this at Aethercon. That's another great thing I hope we see more of. The game itself looks fairly grimdark: a mix of Image comics, '90's flavor, less subtle Ultimate Power, and maybe Abberant? CERN has an accident in 2008 which creates H.E.R.O.es (Humans Exposed to Radioactive Outbreaks). 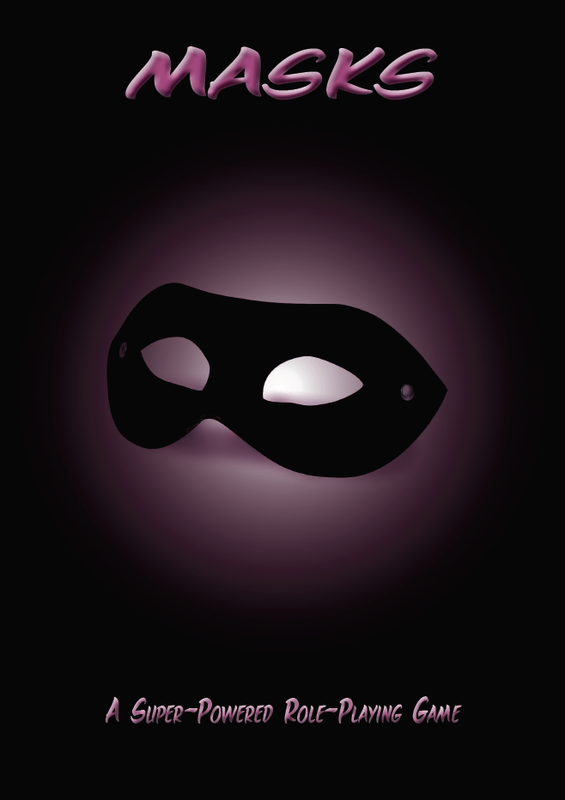 They gain star status, but begin to succumb to normal human corruption and passions. The teaser images include a super fashion magazine cover, a costumed protest, and a pile of half-naked dead bodies. I couldn't tell much about the system itself from the publisher material: "Original incremental dice system rules. No modifiers, thus no hard calculation skills needed. You will not be required to roll too many dice at once. Full rule coverage for every single natural phenomenon. Easy rules for beginners and rich experience for experts." We'll see what it looks like when it comes out in English, likely in 2016. I lose geek cred for the gaping chasms in my comic book knowledge. As I mentioned above, I skipped the '90s in comics, but I also missed some of the second-tier comic publishers like Valiant. I literally have no idea about this comic universe, except that 1) it looks pretty dense, 2) The guys on the Wait, What? podcast seem to think their recent output is solid, and 3) they have some kind of Toy Story/Quantum Leap crossover book? Maybe? In any case licensed supers books have not done well in recent years, and those outside the Big Two have rarely gained traction (The Authority RPG, The Maxx, Superbabes). 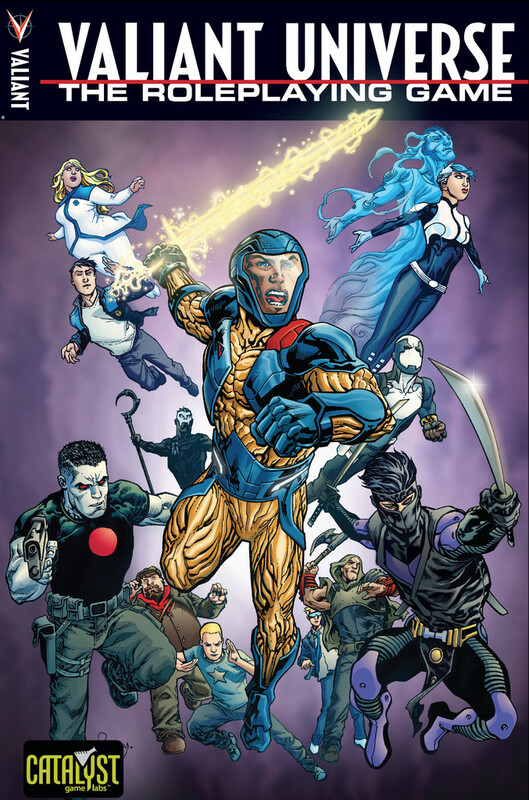 But Valiant Universe has the backing of a strong publisher who pushed the game solidly with several playable demo packs featuring different characters from the line. It doesn't hurt that the game itself looks great- with solid layout and art. As well the comic publishing landscape has changed, with greater and more diverse access through electronic distribution. So maybe it can last? The system itself uses variable dice to represent quality (stat dice) combined with a d12 base dice. It reminds me a little of The One Ring, with larger die types in place of more dice. Powers are simple and each character has different narrative cues they can call on. There's hints of Fate, Marvel Heroic, and many other systems. The biggest innovation is the rotating role of the Lead Narrator. Essentially the LN controls the action for one complete scene. After that the LN role passes to the player on the right. That's a radical approach and the one which I've seen turning off some players. I like the idea and I’m curious to try it. The system itself feels light enough that could work. If you like story-leaning supers RPGs check this one out. 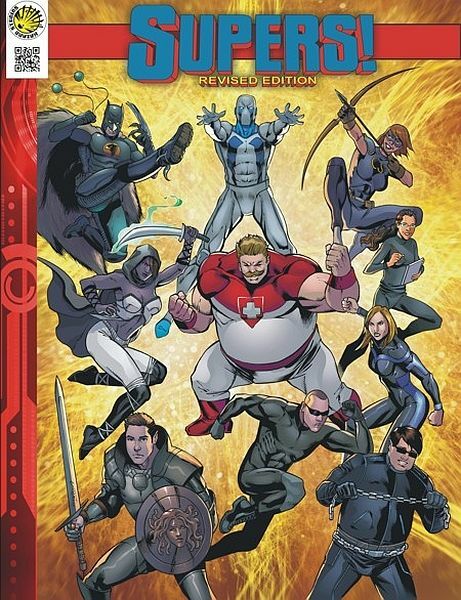 If you're looking for a Valiant Comics sourcebook, this is also a good buy. My only worry is that catalyst has done nothing to support this line. Besides the original Quick Rules (and their expansions) they've released nothing for the core line in the year+ since it came out. I've done a capsule review of Venture City Stories, so I'll steal from that. It's a brief supers supplement for Fate Core. Venture City Stories is cleanly laid-out, following the template established in other Fate products. It looks good, with highly functional sidebars and call-outs. There’s a wealth of solid art here for a small product. Illustrator Tazio Battin delivers with an excellent and evocative style. The images manage to capture the sense of a world with high level supers and street level conflict. Venture City is a focal point location, a grim and murky urban center with corruption run through it. It exemplifies the rest of the setting: a world questioning supers and a deeply blurred line between good and evil. It reminds me a little of Hub City from the DC Universe. The whole tone feels close to Marvel’s Ultimates universe. You could also compare it to Aberrant, but dialed back significantly. Essentially players come up with a core concept for their power. They break the important features of that power into discrete stunts. Each power has a Drawback; really a trouble aspect for it. But it also has a set of Special Effects- microbenefits which can be called on when a player succeeds with style on the use of their power. They can also use their power in overdrive which gives them an amazing result, but inflicts a Collateral Damage effect. One of the examples is a Speedster able to travel anywhere in an instant but tearing up the streets behind them. It has some other cool elements, as you can see from my full review. I dig it and have run using the mechanics a couple of times. Evil Hat has promised an expansion to VCS, adding more examples and templates for powers. I've played Worlds in Peril a few times now. It offers a Powered by the Apocalypse framework for supers. Yet Worlds in Peril feels very much like a broad and classic supers rpg (ala Mutants & Masterminds, Champions). You can do various simple builds and the meat of the game focuses on combat and conflict with villains and their plots. There's a little bit of social stuff in the "Bonds" mechanics, but those very much have a supporting role. I wasn't sure about the game honestly. 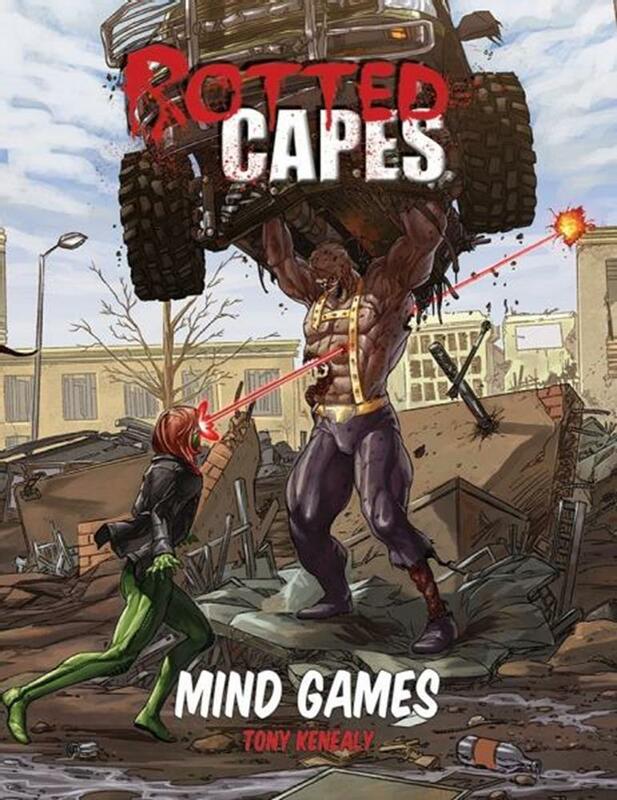 I backed the Kickstarter mostly because I dig superhero games. But I've come to like Worlds in Peril and appreciate the approach it takes. That being said, the order of information makes learning more difficult than it needs to be. I found myself reading and rereading several sections before I got how it worked. Even then, when we played I had several pieces wrong. Bottom line: the writing makes the game more opaque than it needs to be. I say that as someone who enjoys and recommends Worlds in Peril. It has some great ideas and can move fast. But be prepared for the radically different approach it takes to powers. Recommended. Side Note: I've been asked about the difference between WiP and the other recently Kickstarted PbtA game, Masks. This is a really rough impression, but Masks has more crafted archetypes (called playbooks) which you can tune. More mechanical attention's paid to social interaction, status, leverage, and interpersonal relationships. How you get along with your fellow heroes, your peers, adults, etc affects stories and play. That's really rough, but Masks is much more tuned to a particular kinds of supers game. I'm always interested in seeing how designers approach that. A Spanish rpg in which second-string supervillains have to battle an alien invasion. That sounds a little like Necessary Evil, but more tongue-in-cheek. The publishers blurb stresses the simplicity of the system and cites Apocalypse World, Houses of the Blooded and Spirit of the Century as inspirations. It also mentions that the characters may be more of a threat to one another than the enemy. I'm curious if that's an off-hand comment or actually mechanically part of the system. PvP elements, IMHO, can break a group. They have to be handled carefully. Three stand-alone rpgs received new editions in 2014. Bulletproof Blues (Second Edition) updates a game which came out only in 2013. This version does little to change the actual mechanics. Instead it expands the examples and advice from the first edition. That only adds about eighteen pages to the count. 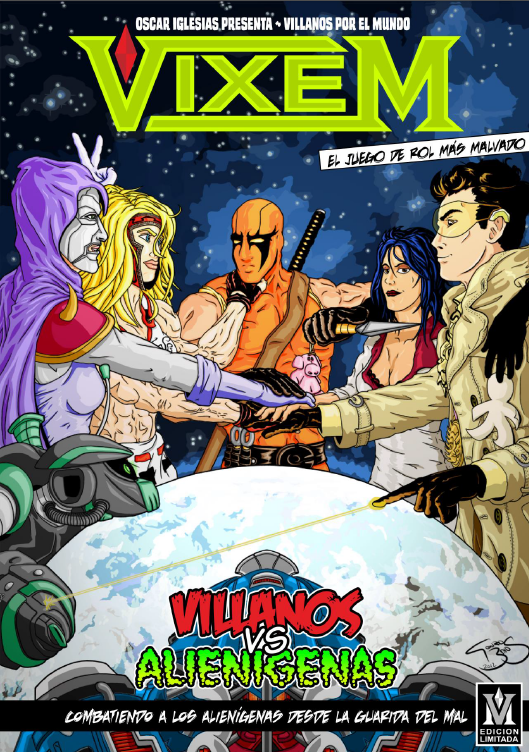 The Invulnerable Super Hero RPG: Vigilante Edition is a new edition of the 2011 game. This cleans up some of the mechanics, adds some new options, and changes the interior artwork. The project had a failed Kickstarter but released anyway. I mentioned the original Supers! on the 2010 list. That game has gone through some publication contortions. This revised edition came out of a successful Kickstarter. There's a distinct difference in the look: while the earlier version had cartoony art (ala ICONS), this one looks more like something from Valiant Comics. This new edition expands and develops the mechanics originally created by Simon Washbourne. It still offers a reasonably simple, d6 based engine but with additional options. The response has been mixed. I've seen a number of positive reviews and players citing this in "What Supers Game to Use?" threads. But I've also seen reviewers take exception to the changes and finding them scattered and broken. Yet even that critique still calls this one of the best generic superhero games out there. If you're a system-hound for supers games, you might want to check this out. Ah Villain books, the bestiary of superhero systems. Tthey lend themselves to individual release, so we've seen micro-pdf products and series lately. Hence this listing may not be complete. Mutants & Masterminds 3e did well. Black Wyrm Publishing began a new series, The Algernon Files 3.0. However they've only released a few. 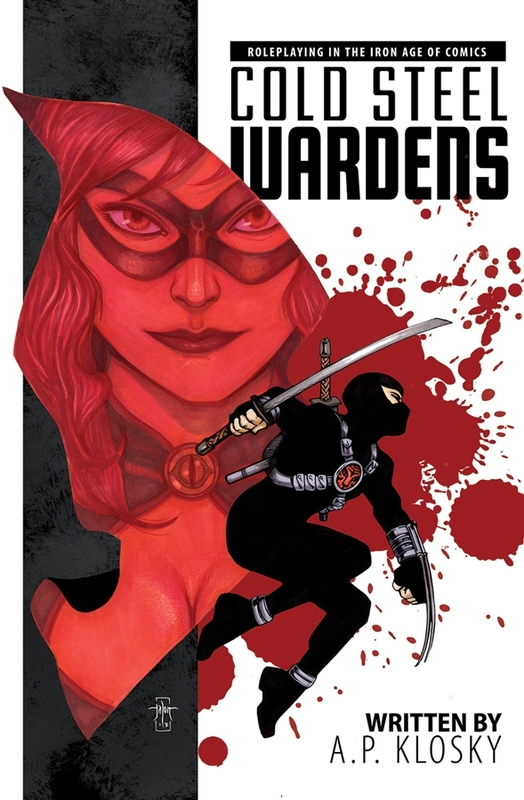 WatchGuard: 7Ronin offers another set of adversaries set in the WatchGuard world. Rogues, Rivals & Renegades has a series of individual villains with commentary from several organizations. Acts of Villainy continued to roll out, broken into three types: Masterminds, Solo, and Teams. ICONS has several new or ongoing series: 3RD Power presents High Science villains; Space Supers covers “The Great Game” setting; World’s Most Wanted is fairly classic; and Do Gooders & Daredevils works for this and M&M 3e. Other system received less support. 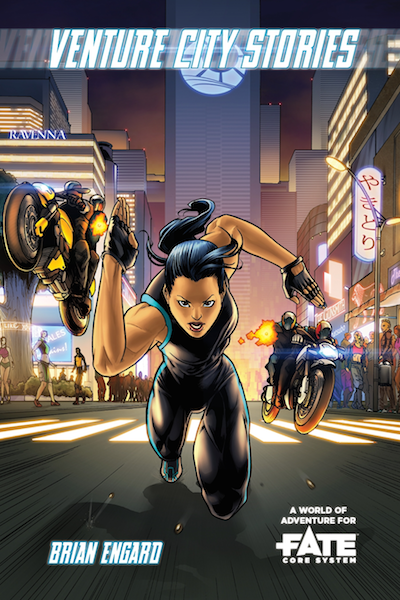 Villains: Accelerated came out in several versions including Fate. 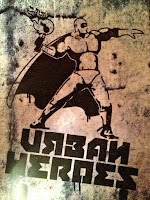 Heroes and Vigilantes offers a collection of characters as well as setting details for use with the MADS rpg. Soultaker Studios added to their Adversaries series with support for BASH, SUPERS, G-Core, and Capes, Cowls and Villains Foul. 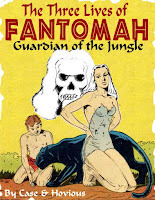 NEULOW continued their interesting series providing d20 Modern adaptations of public domain characters like The Three Lives of Fantomah: Guardian of the Jungle and the Complete Golden Age Oddballs: Kismet & Penny Parker. This is a great series to check out if you like classic Golden-Age stories and high weirdness. Finally, Las Mejores Historias del Centinela Jamás Contadas expanded the characters of the Spanish Supers rpg La Mirada delCentinela. Bangers: Trigger Happy's an odd little rpg, aimed at emulating high-octane gun-bunny movies like Die Hard, The Killer, The Transporter, and so on. Essentially hard and heavily armed characters blasting it out and flying in slo-mo through the room with guns blazing. Bangers offers a setting and rules expansion for TH, where youths battle it out with superpowers instead of firearms. Base Raiders/Savage Worlds Conversion Guide: One of several guides released. That's great- I love the setting, but don't dig the system as much. Future Heroes (Fate): A Legion of Super Heroes-esque frame for Fate. It comes from Starbright Illustrations who don't have a great track record for Fate supplements. Caveat Emptor. Iron Bay Virginia (ICONS): One of several "Actions Have Consequences" products converted for use with the latest version of ICONS. Savage Worlds Super Powers Companion (2nd Edition): This has a good amount of new material as well as updates to the previous mechanics. Assault on Precinct 9: Set in Stark City, written for ICONS, it has the PCs stopping a jailbreak. BETA Men: A new M&M 3e module for the Amazing Stories of WWII setting. Evilution Unchained: A massive three-act mystery campaign for both ICONS and Hero. Superhero campaign modules are fairly rare, so that's a welcome release. Fiasco: This game saw two superpowered adaptations. Bats! offers a world where everyone plays a gravelly-voice version of Batman. X-People has mutants amok. Heroes Wear Masks: Avalon Games published several modules for their Pathfinder-based system. Freak Nation, God in the Machine, Native Population, Pax Demonica , Playing Your Cards Right, and Rise and Fall of the Phoenix. 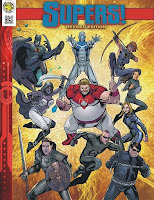 ICONS: Ad Infinitum released two adventures: The Metaskulk Invasion and The Nemesis Crisis. The company continues to do a good job keeping this line active. Scene Stealers 1: Black Ice: The first of a series of short modules for Supers!. It has the players dealing with a cold-themed villain. 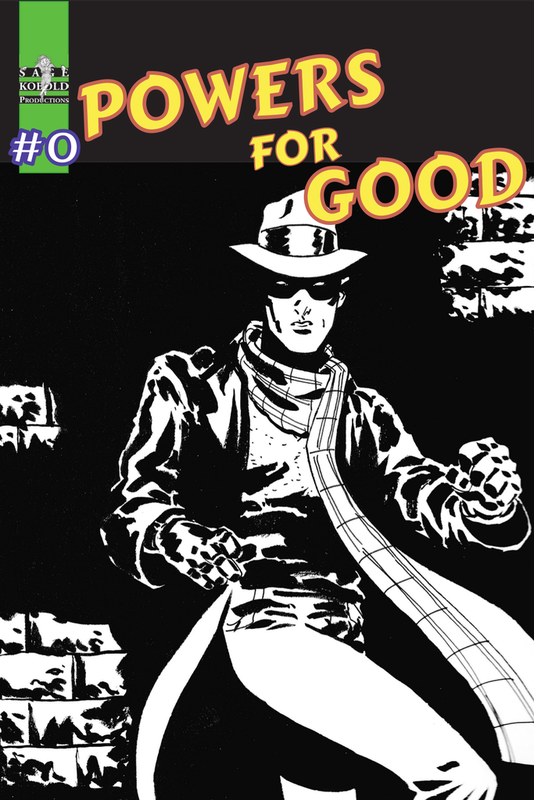 Super-Special 2014: A Free Comic Book Day module available in M&M 3e, ICONS, or Supers! flavors. Awesome Powers: A series of substantial supplements for BASH!. Each details a different power set. This year saw the release of Force & Gravity and Mental. 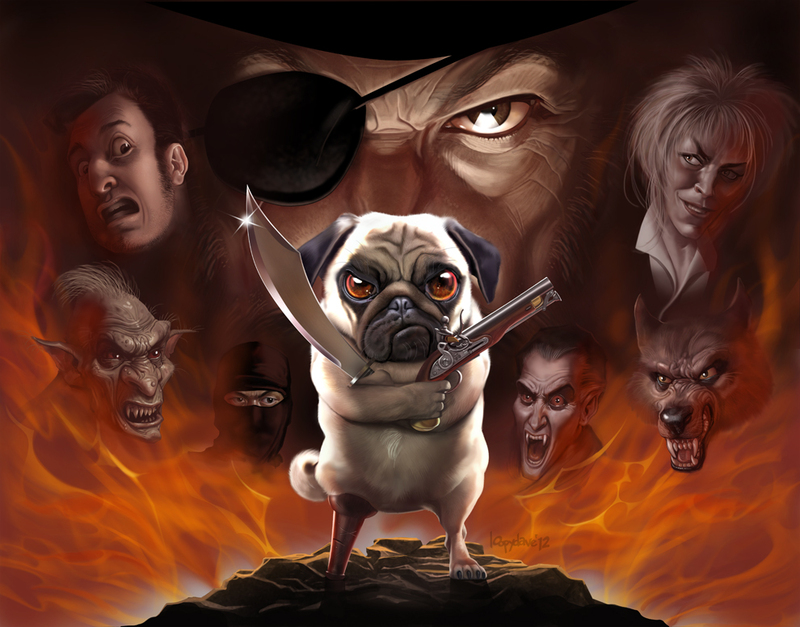 Public Enemy: A chunky supplement for the weird manga-inspired Double Cross rpg. This adds options for playing villains, new traits, more background on existing organizations, and a detailed random scenario generator. Splinter City: A Protocol series game. These are rules-lite rpgs sharing a system, created by jim pinto. You don't play heroes here, but instead normal folks going about their day-to-day lives in the shadow of superhero-dom. Think Astro City. Super8s: Two short supplements for the "Crazy8s" rpg. They add a module for playing. The two books complement one another, but the first volume has the basics you need. Superstring Multiverse: Offers multiversal enhancements for M&M 3e. It discusses related powers, presents characters & universes, and offers ideas for managing these campaigns. The company has supported this with two additional expansion books. I'm posting this on Black Friday. I always get that mixed up with Black Sunday...which was a movie I wasn't allowed to watch as a kid, though I saw all the previews. Someone bombs a stadium, I think? Anyway, it's an auspicious day for a Play on Target podcast on Combat, given the fighting in the retail trenches today. It's dangerous to go alone! Take this! Anyhow it has taken us fifty normal episodes to arrive at one just dealing with combat. Yes, you heard that in your head as you were reading it right. This is our fiftieth show. More if you count our interviews and GM Jams (but let's not because that sounds less cool). This time do a round-table of advice about combat. It makes us sound like blood-thirsty monsters and beasts who have fights every session. Scary! We're not and it isn't (or something...). It's a topic I've written about a little on the blog here. Check out my 33 Things I Want From Combat As a Player & 23 Things I Want From Combat As a GM posts. Note how tremendously wrong I am! Options and Complexities come at a cost. I know it sounds obvious, but that can get away from you. As a GM I want to have lots of cool details and options for the players: maneuvers, conditions, special actions. But each one potentially adds to the time: through choice paralysis, rules look-up, or time to resolve. GMs who hack and modify should carefully examine combat choices. One approach is to put most of the choice and special options in the hands of the characters. For example, 13th Age offers little in the way of “global” special maneuvers beyond Grappling and Disengaging. All the cool stuff comes from your class. That works if everyone knows and has a handle on what their character can do. It breaks down when new players join ongoing campaigns and have to play catch-up. The bulk of mastery should lie with the players, but the GM should also have a modest grasp. Not necessarily to prevent abuse, but more to remind players when they have forgotten an obvious option. Mooks are fun. They’re useful to provide everyone a target and they can “crowd control” the party. But it’s easy to get carried away with these. Unless you have a system for multiple strikes, Mooks and lower powered baddies each take at least a hit to take out. If the player misses, that’s another potential uninteresting action. That can slow a game to a crawl. On the other hand, single Big Bads permit the players to coordinate and pour on the damage. Without support, these will go down faster than you expect. Play accelerated once I gave up on measuring. I use Zones (from Fate) or relative distance (13th Age) for everything now. Even before that I’d go "yeah, you can move that far," just to keep the fighting moving and interesting. Know the lethality of your system. How many HP does the average character have? Do any of the PCs have glass ninja builds? That’s especially true with new systems: I ran The Warren and Monster of the Week for the first time last week. They have very different damage/HP mechanics from my usual games. 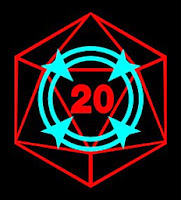 Dial things up slowly- if you massively jump up the difficulty of your fights because you’ve had some weak sessions, you run the risk of blowing out the group. I’ve seen that happen a couple of times. There’s nothing quite like an unearned TPK. Sometimes players will come up with plans to do things. Schemes, plots, ways around. My instinct in the early days was roll, roll, roll until you die. I had combat ready and they were going to get there. Maybe they’d get an advantage from their plans, but we would get to the fight. Eventually I learned better, but the instinct to push to a sharp and clear conflict can be immense. Combat shouldn’t be punishment. This was a comment I saw on G+ a few months. If the cost for failing a skill roll (like a Stealth check) or making an uncertain choice is a road bump fight, that’s kind of crappy. Eventually you train your players that doing anything could risk being bogged down in another throwaway row. Consider other options and consequences. Make the fights significant. FIGURE OUT WHY YOU’RE HAVING THE FIGHT. What are the stakes, who wants what, what could end the fight other than total annihilation? Shout and point. Works better f2f than online. Keep things moving, but give the players enough time to work through what they’re doing. I try to go into one of two modes when I’m listening to actions in combat. 1) Let them talk & describe their actions, and then translate that into the mechanics or 2) Let them declare and then ask for color (what does that look like?). Support proactive and creative players. If they try alternate approaches, don’t just shut those down. Some things obviously won’t work, but if there’s room in the rules & your play style let that happen. I’ve played with GMs who would assign low chances and almost no benefits to anything beyond swings in combat. So we swung in combat. If the game doesn’t provide good options for non-combat builds, that might not be a good game unless you want to be playing miniatures. This is a simple framework for handling pick-up games or on-the-fly campaigns 'Powered by the Apocalypse.' In several ways this whole concept goes against the strengths of PbtA. The best adaptations brilliantly emulate a genre (World Wide Wrestling, Monsterhearts). They tune into that play. And generic approaches can feel colorless and ill-suited to some things. I say that as a person who has played lots of generic games (GURPS, Hero, Fate, BRP, etc). So why do this? For one thing, I have a lot of game frame ideas. I think they’ll work, and I could spend a lot of time building all of the structures. I’ve done that many times before. But I don’t want to waste a lot of energy. If we say “hey, let’s do this,” I want to do it then, not spend days building or rewriting another game it to fit. For another thing, I have people I enjoy playing with who don’t like my go-to pick up game: Fate. That’s cool. They usually have at least a passing familiarity with PbtA mechanics, so I'll use that. Finally I want something easy to run online. Note that this is influenced by some of the other stripped down PbtA versions like World of Dungeons and Simple World. I want these rules to allow a GM to set things up quickly. Throw down a simple character sheet, drop a reference page, establish some facts, and easily get to playing a one-shot. But more importantly I want this to handle short campaigns with emergent play. 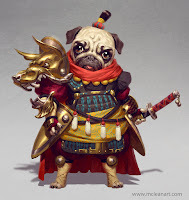 In Pug'buttah you can come up with a campaign concept, build characters, start playing, and have rules evolve over time. A few years ago, we played a campaign called "Last Fleet." We did collaborative world creation, and I knew we were going to use our homebrew card system as the basis. But I decided not to write up any new modules and rules. Instead I asked the players what they wanted to be able to do: i.e. what cool stunts, powers, feats, etc. they wanted. From that I built each character a set of abilities. I put these on cards, and they could buy them as they wanted. Some had prerequisites, so a structure developed. I checked with them every couple of sessions to ask what new abilities they wanted. The pricing system meant they could never buy everything and had to make hard choices. Effectively we built talent trees on the fly for individual characters. That’s what improvements are going to look like here as well. It may work even better with this, since GM Moves make the work even lighter. These discussions assume you’re somewhat familiar with how PbtA games work. Also, as you may have noticed, I use GM in place of MC. Once again I stomp on the spirit of things. But that term's pure habit for me. In the discussion below I’ll be using names for things like Moves, Stats, and Improvements. Consider these placeholders. One of the easiest ways to establish the genre feel is provide genre appropriate names. 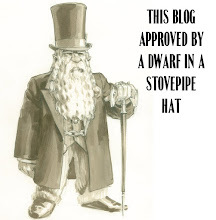 Overelaborate terms for Steampunk, with a drawl for a Western, or sharp and edgy for Cyberpunk. This can be a point of collaboration for the group. This game begins with a conversation about what the group wants to play. I’m going to assume that you’ve generally established the premise or genre beforehand. Here you want to talk about the expectations for the game. In particular, talk about what characters do in this kind of game. What sorts of things happen and what narrative focuses on. That’s important even if you’ve defined what seems to be a commonly shared concept. Genre can be dangerous, with players owning different senses of it. You might say "Paranormal Romance," and have one player come at it from a Buffy PoV while another's thinking True Blood. Make a list of activities and consider what typical heroes have as goals. For example in a Star Wars game: Fly Spaceships, Dogfight, Evade capture, Use the Force, Deal with Troops, Overcome the Odds, Swashbuckle, Struggle with Darkness, Draw on Inner Strength. Or let’s say an X-Men game: Use Powers, Deal with Suspicion, Inappropriate Personal Issues, Expose Conspiracy, Mutate, Avoid Detection, Protect Innocents, Retcon Backstory. Or Lord of the Rings: Travel the Wilds, Evade Pursuit, Overcome Animosities, Go to War, Ancient History, Resist Shadow, Cut through Hordes. These should help form a pool of Custom Moves you can create either before the game starts or during play. Ask if there are things you wish to Ban which usually appear in this kind of setting or Add which don’t normally show up. 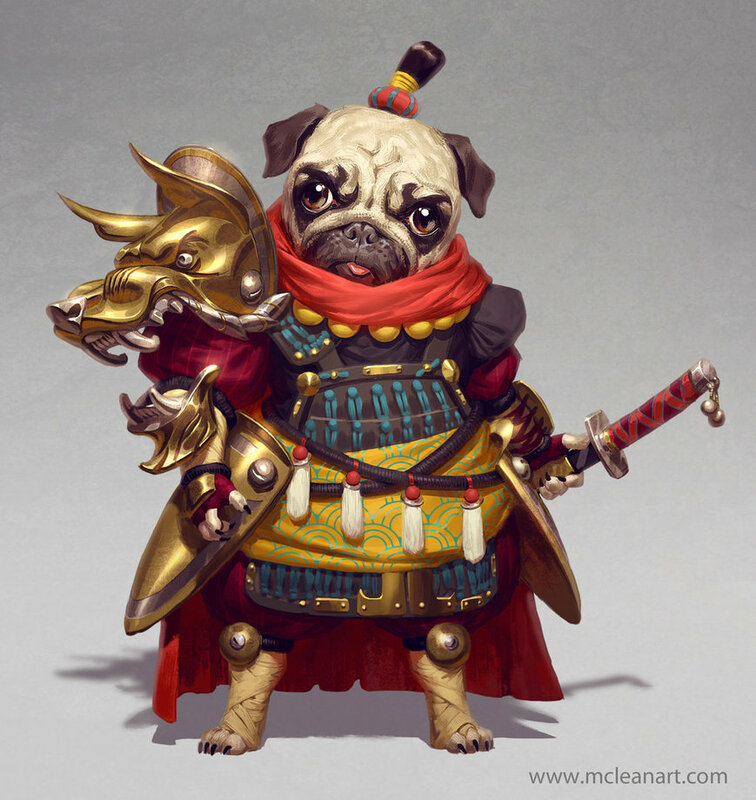 Characters have five or six stats which are used with rolls. The exact composition of the stats depends on the genre involved. Stats have a max of +3; players begin with these values to distribute: -1, 0, +1, +1, +2, +3. If you want more competent characters for a one-shot go with 0, +1, +1, +2, +2, +3. If you’re using five stats, drop a +1. Some games use five stats, like Monster of the Week (Charm, Cool, Sharp, Tough, Weird) or base AW (Cool, Hard, Hot, Sharp, and Weird). These are useful set ups for groups highly familiar with the system. For purposes of explanation, I’ll use Charm, Cool, Sharp, Tough, and Weird as the default terms. Understand they represent a concept, rather than a specific stat name. Other games use six stats include the classic D&D list, useful if you’re doing a fantasy game (Strength, Dexterity, Constitution, Intelligence, Wisdom, and Charisma). If you want something more abstract, go with approaches from Fate Accelerated (Careful, Clever, Flashy, Forceful, Quick, and Sneaky). I like these because they have a built-in methodology and point to the kinds of complications and costs which can arise from a bad roll. Consider the focus of the game. If you think play with center on investigation and figuring things out, you’ll want two kinds of Intelligence stats. For investigation games, split “Sharp” into Knowledge and Perception/Observation/Wits. If you think it will rely on social manipulation, then you’ll want to split out charm. For a social game, split into Charm and Presence, representing soft and hard approaches. Alternately, consider Charm and Pull, with the latter covering favors, connections, and networks. If you think it will lean on combat, you’ll want to break up physical traits. For action oriented games, retool “Cool” and “Tough” into split physical stats like Strength, Agility, and Toughness. This is a decision the GM will probably want to sketch out before sitting down with the group to plan the game. I’ll be using the following terms mostly as they appear in other versions. Forward +X: Add that to your next related action. So in combat, usually another attack or escape. After uncovering info, a bonus to an action using those details. In some cases, what I’m calling “Set Up”, you can pass that bonus wholly or in part to another character. Hold X is a currency, spent to achieve an effect, ask a question, or gain a benefit. Hold may decay over time. Ongoing +X: a bonus to rolls for that character for the rest of the scene (or until something major changes). These moves cover a lot of ground. Distinctions occur in how the action’s described, the actual situation, and the stat called for. For example trying to read a person through conversation might be rolled with +Charm instead of +Sharp. Indirectly trying to bring someone’s organization down might be rolled with +Sharp or +Charm, instead of +Tough. Principle: When you do something, you roll the relevant Move with a stat appropriate to the situation. Principle: Give the player a chance to say and justify why a particular stat fits. …“Set Up” something (+2 Hold). 7-9 You move attitudes slightly towards what you want, but greater results come with a catch, complication, or cost. Attitude shifting and relationship building require time or leverage. Persuasion always requires leverage or a debt of some kind, which may be spent by the transaction. Note that this covers PCs acting on NPCs. The group will have to decide how and in what way Interaction skills can be used on other players. Roll this when you’re engaged in a conflict and attempting to deal Harm. This assumes an active and dangerous opponent. When you fight, you take 1 Harm unless you negate that through an effect pick. You also deal your base Harm (see Harm and Damage below). Fights don’t have to be physical, they could be political struggles, debates, or a hacker clashing with a system. In these cases, the GM will establish special Harm tracks, as well as damage/armor for the event. What about Shooting? If you’re under no threat—no one nearby to affect you and no shooting enemies—the GM may say you take no harm. (Note: Should that reduce picks?) Alternately they may say it isn’t really a Move and simply have the player deal Harm. Roll this when you want to learn something. This can be doing research, hitting the streets, looking around, sensing danger, considering your own experiences. General information should be obtainable without a Move. But if someone wants to use their expertise to discern something they make this roll. 7-9 Gain 1 Hold to spend on questions. Each Hold spent allows the player to ask a single question. The GM should answer this clearly and directly, allowing for some follow up and clarification. What kinds of questions can be asked? Usually the Who, What, Where, When, and How of things. That sounds broad, but this covers a large range. What they can ask is only limited by the fiction of their character and how they’ve narrated their discovery process. Players and GMs may have to walk through the process and limits. In my experience, players tend to go less meta than I expect (or would allow). If unclear, GMs may ask players to explain how they would learn something and permit them to reframe if necessary. Specialty knowledge and discovery processes with added benefits make great Custom Moves (see later). Roll when you’re acting directly to do something. That means most everything else not covered by the previous three moves. Your opposition may be active or passive. Trying to avoid a landslide, hacking a computer terminal, repairing an engine, training horses, organizing your troops, putting out a fire, leaping a crevice. 10+ You succeed in your attempt. 7-9 You succeed, but at a cost or with a complication. In order to use this move, the character must be able to perform the action. So a normal person can’t flip a loaded semi-truck. An untrained person can’t perform brain surgery. A human can’t survive in the vacuum of space for hours, you can’t write the great Russian novel in an afternoon. Logic and drama should equally be your guide. Define success clearly. In some cases, succeeding may simply be mitigating or stalling. Sometimes the Act moves involves aiding or setting up another person. In this case mechanical success confers a +2 Forward for that person. The cost on 7-9 may include getting more deeply caught up with the results of the other character’s action. How you handle Harm depends on the genre and tone you’re going for. I’m going to present a simple version, but then I’ll talk about some other approaches. Characters have seven boxes of Harm they can take. Most attacks do 1 Harm. However strong and more potent attacks do +1 Harm. These are usually bigger, bulky, or non-concealable weapons. Heavy armor can be worn, but this is also bulky and hard to hide. It reduces damage by 1. Character are taken out when they have no Harm left. Circumstances determine what happens next. If they can be treated, they can wake up after a scene. Harm clears after a scene of recovery. A character may reduce any damage taken down to 1 Harm, by taking the condition “Injured.” An injured character needs hospitalization and is open to GM Moves playing on how messed up they are. If an Injured character is taken to no Harm left, they’re taken out and Crippled. Crippling either reduces the rating of a stat or puts a cap on one of the four basic Moves, meaning they can never get above a 9. The GM and player can negotiate what this means. If you want more detail, create a weapon/attack list with weapons doing 1-4 Harm. Weapons may have narrative tags which the GM can use for complications and the player can use for narration (i.e. “Reach” for a Halberd, “Unwieldy” for a minigun). In this case, you’ll also want to have several degrees of Armor, say 1-3. Depending on how brutal you want that, you’ll want to increase the amount of Harm characters have. At the start of the game players begin with three improvements. They can decide these at the start or in play. During play, players tick off advancement boxes. Every five advancement boxes they gain an improvement. Generally players should be moving at close to the same rate. If the group doesn’t want to track things, then the GM simply tells the group to take an Improvement after significant sessions. You botch a significant roll, 6 or less, which has serious consequences. This is a learning experience. You can do this up to three times per session. Each player should write down a) a character cool moment they want to see happen and b) something their character’s really reluctant to do. When you do either of these, mark a tick and cross it out. At the end of the session, come up with a new one for each crossed out element. If you come up with a new, non-character specific, setting-appropriate Custom Move for the game which everyone likes, mark a tick. The GM tells you to. Players can create one of three things when they gain an Improvement: a Custom Move, a Skill, or Stuff. On Terminology: I know Moves usually refer to a wide class of abilities in PbtA. In this case, I’m using the term Move to refer to the roll 2d6 +Stat structures. I know that’s an artless distinction, but everything about this is heavy-handed. The same with the term “Skill.” PbtA studiously avoids that. I’m using it because it has a fairly clear definition. Players can come up with Custom Moves. These follow the usual 10+ succeeds; 7-9 succeeds with cost formula. The player and GM work together to define the stakes, range, and limits of these moves. They should be cool and fit with the character’s concept. Sometimes the player may come up with a Custom Move that seems to fit the genre broadly, rather than being tied to a specific archetype. If so, add that to the general pool of moves, mark an advancement tick, and come up with another move. Note: Players can come up with Custom Moves for themselves, others, or the group as a whole at any time. Write them down if everyone likes them (and take an advancement tick). General Custom Moves become available immediately, others have to be taken as Improvements. As you can see above, the four basic moves cover a good deal of territory. These can be used as the basis for a character’s custom move. The general rule is that if the custom move covers a narrower range, the player may have the success create greater effect. If your character’s good at doing something specific, you gain a +1 doing it. This should be a narrow range. Driving a car, climbing, surviving a hostile environment, spaceship gunnery. Skills never stack. This is the “everything else.” It can be anything that a) isn’t a rolled move or b) isn’t a flat bonus to a narrow activity. It might be additional Harm or Armor, if you want to go down the combat route. It could be a gang of henchpersons you can send out to do things. It could be robotic legs which change the fiction of your character, allowing them to make crazier act moves. It could be owning a spaceship. It could be super-powers. If something’s pretty potent, it should have a limit. It takes a Move check to use, always creates a costs, can only be used once per session, etc. Monster of the Week has “advanced moves.” These give a special bonus for a roll of 12+ on a basic move. That’s an option, but should still have a defined range. For example, if I’m a Gun-Bunny, I might get a special bonus when I roll a 12+ while making a Fight move with my guns. Go look at other PbtA rules and steal from those. Borrow, reframe, and modify bits from other games that work. The key concept is that the rules evolve just as the characters do. If the GM’s comfortable with it, early on they may come up with the Improvements. Ask each play what they’d like their character to be better able to do better. Make them prioritize. Come back the next session with three things for each player: a Custom Move, a Skill, and a Stuff. This takes some work. You can usually build up a nice backlog early on, and later have the players come up with more of this once they’ve seen how it works. At the start of the game, each player should establish a Positive and a Conflicted relationship with other players. Mark down +1 History with each of these characters. Positive relationships mean good feelings, background of assistance, infatuation, whatever. Conflicted relationships mean jealousy, hidden resentments, and past unforgotten slights. During play, when you sacrifice (an action, a resource, an opportunity) to aid another character they add +1 to their History with you. The maximum a History can be is +3. If you ask a favor of someone else and they refuse, reduce your History with them by 1. When you “Set Up” another character, you may roll your History with them instead of another stat. This reduces the History stat by 1 (and doesn’t increase the other person’s History). If this is the person you have a conflicted relationship with, you may reduce the History to 0 and gain an improvement tick. Players may “burn” their History with someone if they have a +3. This may be done after roll is made and resets the History to 0. Describe how the player you have the History with is suddenly assisting you or intervening. The other player may agree, in which case you bump the success up one level Fail to Partial, Partial to Full. If they disagree, you gain no bonus, but may tick an Improvement box. Note: This is the roughest part in my mind. No sure about how I want to handle this. May well depend on the genre more. Negotiate Moves: When players suggest new Custom Moves, either for themselves or for the group, work with them. Get agreement about the appropriateness of it. Define the limits and successes. Be open to the possibilities. Once a Move has been created, accept that as part of the fiction. Develop Improvements: If you’re building the improvements for the players, listen to what they want. Work to come up with clever versions. If players ask for something large, consider breaking it up into chunks. Provide hard choices: good things on both sides they’ll have a hard time deciding between. If a player’s identity changes through play, develop for that new identity, not the old one. Protect Niche: When developing Improvements, make sure that new additions don’t invalidate earlier ones. Talk with players about what they see as their identity and try to support that. Focus on Theme: Come up with game concepts related to the theme and actions, AS THE PLAYERS DEFINED IT. Often you’ll come up with Custom Moves which are mostly a reskinning of the Basic Moves. Why do this? Why not just use those? Because it adds to the flavor and feeling. At the same time, if you’ve come up with a Custom Move and players forget it repeatedly, talk about cutting it. Pick Appropriate Stats: Use the choices of stats in combination with the basic Moves to create flavor. Consider the players intent and description. Consider Balance: Don’t worry about balance. EXCEPT if a player or players seem bothered by the ease with which another player gets to do awesome things. Listen for those grumbles. Sometimes, it’s because a player has accidentally or deliberately built a character which doesn’t work in the context. They may be perversely stick with that conception. Engage them about that. Other times it’s because something’s broken. In this case, work to make other people cooler, rather than nerfing. That’s usually awful advice, but we’re talking about a short-term campaign. Who cares? Introduce Custom Move: Just like the players, you may see a new custom Move which fits with the genre. Sketch it out and see what the players think. Discard if there’s no agreement. Need to think about this part more. As I’ve sketched it here, this seems like something for a short term campaign. A true pick-up game might require more sketched out options (improvements) for players to pick from at the start. Have to narrow the choices to make entry easy. Thoughts? Changes? Suggestions? Things I Missed?